This one-day, fast-paced course covers the most critical issues for this unique specialty. It's packed with the instruction and tools interventional pain specialists need to get paid and improve the bottom line. We'll start with coding and reimbursement essentials such as Medicare rules and updates - including bundling and CCI edits, and the payment structure of RVUs. You'll get a brief overview of evaluation and management services and review hand-on case studies to sharpen your documentation skills. Next we will discuss the complex issues that surround diagnosis coding for pain. Using actual payor coverage polices for pain treatment, you'll learn how to incorporate policy guidance into your daily practice and process. We’ll dissect the clinical criteria and diagnosis codes that form these policies, and the must-have documentation to justify coverage. 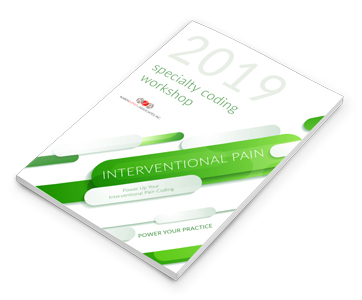 The entire afternoon is dedicated to interventional procedure coding for spine, joint, soft tissue, tendon, nerve block injections, PRP and more. You'll learn to code using real case examples.  Anesthesiologists, neurosurgeons, orthopaedists and PM&R physicians who deliver interventional pain services and procedures.  Other providers, managers, billers, and coders who work in pain management, PM&R and orthopaedic neurosurgical practices that treat pain.